Palestine City Hall is located at 504 North Queen Street, Palestine TX 75801; phone: 903-731-8400. Photo: Howard House, ca. 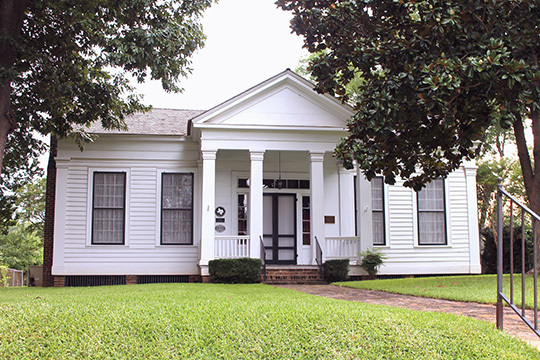 1848, 1011 North Perry Street, Palestine, TX. Listed on the National Register of Historic Places in 1993. Photographed by user:Renelibrary (own work), 2014, [cc-by-3.0 (creativecommons.org/licenses/by/3.0)], via Wikimedia Commons, accessed April, 2015. The Texas Legislature created Anderson County out of Houston County in 1846, and the town of Palestine was established in the same year to serve as a county seat. For the next quarter century, the town, whose existence was based on both its designation as the county seat, and also its central location in a large cotton-growing region, developed slowly. Palestine's size and character changed dramatically following the arrival of two railroads in 1872. The International Railroad, from Austin, reached Palestine in July 1872, and was followed by the Houston and Great Northern, from Houston, in December of the same year. The two operations soon merged, creating the International & Great Northern (I&GN) Railroad Company, which played an integral role in Palestine's transformation from a relatively isolated, frontier county seat into a vibrant, bustling regional center of business and commerce. In exchange for routing its tracks through Palestine, the railroad received about 80 acres of land one-half mile southwest of the county courthouse, which formed the center of the town's traditional commercial district, Old Town. The railroad, however, created an entirely new commercial district, New Town, by subdividing its land and selling it back to the townspeople. Reluctant to abandon their original town site, Palestine's longtime residents stubbornly maintained a viable Old Town as a counterpart to New Town, which prospered due to its proximity to the new depot. Palestine thus developed two commercial districts, unusual at that time for a town of its size. The economic and social impacts of the railroad were felt keenly in Palestine's various neighborhoods, which continued a process of rapid growth and expansion from the 1870s well into the early 20th century. Each of the city's neighborhoods, referred to as wards at the turn of the century, featured a unique physical landscape that evolved in ways unlike those seen in the rest of the city. The different neighborhoods were the result of a combination of factors that included the traditional use of the land, and also the occupation, economic means, and relative social status of the people who chose to live there. Palestine's increasingly pluralistic society created a number of distinctive neighborhoods that feature fine and well-preserved Victorian-era and early 20th-century architecture. Palestine, the county seat, is an old town situated near the centre of the county, in a high rolling country, on the divide between the waters of the Neches and Trinity rivers, and has a population of about 4,000. The general offices and machine and repair shops of the International and Great Northern Railroad Company were located here in 1875, since which time the town has more than doubled in population. It is the junction of the Northern, Southern and Western divisions of the International and Great Northern railroad, so that it is an important railroad centre. It has 12 stores of general merchandise, 12 grocery and provision stores, 4 drug stores, 2 hardware stores, 2 book stores, 4 commission houses, 3 jewelry establishments, 1 banking house, 1 hide house, 3 furniture stores, 5 fruit stores, 2 saddlery and harness stores, 4 millinery establishments, 2 dealers in agricultural implements, 3 lumber yards, 4 brick-yards, 4 restaurants, 3 livery stables, 3 newspaper and job offices (Palestine Advocate, New Era and Weekly News), a real estate and building association, a foundry and machine shop, a grist-mill, 1 steam cotton-gin, 1 wood-turning shop, 1 mattress manufactory, 2 bakeries, 2 dairies, 1 tin shop, 2 paint shops, 2 gun shops, 4 blacksmith shops, 2 tailor shops, 4 shoe shops, 4 barber shops, 2 insurance agencies, 1 photographer, 3 dealers in sash, doors and blinds, 1 large market-house, and an abundance of lawyers, doctors, dentists and mechanics of all kinds. Palestine contains Methodist, Baptist, Presbyterian, Episcopal, Christian and Catholic churches for the whites, and two churches for the colored people. It has a female college, a select school for boys, and several other good schools, a Masonic lodge, chapter and encampment, and bodies of Odd-fellows, Knights of Honor, and Knights of Pythias. The Masonic fraternity have completed a commodious temple, at a cost of about $20,000, which is the chief architectural beauty of Palestine. The site is upon the principal avenue of the city ; is a brick structure three stories high. The first floor is rented for business purposes; the second contains a beautiful public hall, with ample stage room and a seating capacity of about 600; the third is used for Masonic purposes. The surplus rental of this new building will be set aside as a perpetual fund for the maintenance of a Masonic school, to be established in the building and grounds formerly occupied by this body, at which school free tuition will be given the children of Freemasons resident in this jurisdiction. The machine and repair shops of the railroad company give employment to many men. The building lately completed by the International and Great Northern Railroad Company, and in use for general office purposes, also adds much to the beauty of the city. It is a large, three-story brick structure, surrounded by a park of about five acres, which is being beautifully laid off in walks, and planted with ornamental shrubbery and shade trees. The International Hotel, just completed, is a large three-story building with a mansard roof, and contains about sixty rooms. It is now open to the public, and is kept in first-class style. Within the past year not less than twenty brick stores have been erected, most of which are two-story buildings; and many residences, which do credit to the city, have been erected also. There are several extensive fruit farms in the immediate vicinity of the town. The growing of fruits and early vegetables is now one of the leading industries of the country, and these products find a ready market at remunerative prices. Very low rates have been made by the company, and every facility is being offered for the development of the early fruit and vegetable interest. The advantages enjoyed by the fruit growers and gardeners on this line will be more fully understood when it is remembered that while our season is from six to eight weeks earlier than that of the Northern States, the soil of Eastern, Southeastern and Middle Texas is peculiarly adapted to the growing of fruits and " garden truck." This is especially the case in Anderson county. The profits on the " first fruits " have been, under proper management, large.